Some people like cases on their devices others don’t, but like it or not some need cases and the Nexus 4 is certainly one that needs a Nexus 4 case. Before I continue this review I need to award a title to the Nexus 4. 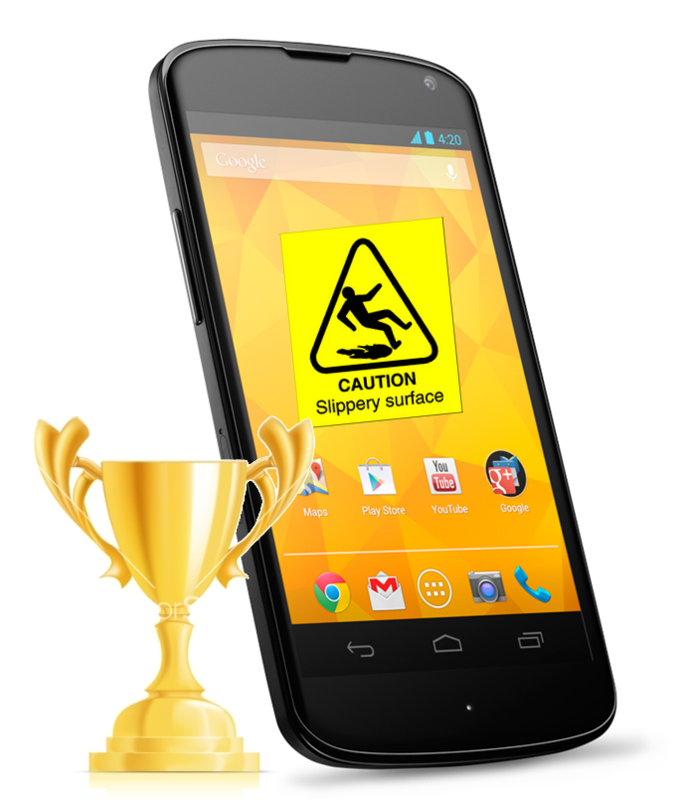 ‘Slipperiest phone ever’ Award 2012/2013. The glass back may look lovely, but it means the device slides off every surface you put it on….every time. (apologies for the double review, internal mis-communication meant we had two done at once). The bumper case – what else do you need? A plastic and rubber bumper (covers the 4 edges of a device) with key overlays for volume and power and cut outs for headphones, mics and usb. The case simply pops in and out giving a slight lip on the front and rear edges and full protection of the 4 sides of the device. The glass on the screen and rear remains exposed but that is what a bumper is always going to do. – Makes the phone a lot less slippery – due to the slightly raised edges which means the glass no longer touches the surface. Not strictly speaking a bad point of the product, more a flaw of bumpers in general. It doesn’t protect the screen or rear of the phone, only the sides. Although I have not had a chance to compare with an official Google bumper (as they have been out of stock the entire time I have owned the N4) I cannot see how it would differ from this one. It fits the phone very nicely and protects in a way that you would expect a bumper too. I am very happy with this to be on my phone and feel safer with it on. Not often I give things a top rating, as it is pretty hard to be perfect.. but this does exactly what it is meant to with no faults that I can see. I’ve got this case, my only issue is the hole for the usb is a bit sharp around the edge when I’m resting the phone on my little finger! can’t say I have this issue, I never put my finger under the phone but I can see that it could be sharp, although mine doesn’t seem too bad.